The festival is being headlined by Bon Jovi, The Killers and The Stone Roses. 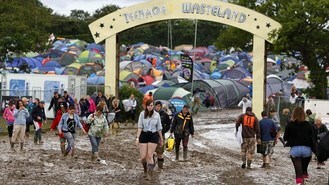 At last year's event, heavy rainfall in the days before led to the car parks turning into mudbaths making them inaccessible and leading to massive traffic queues. This meant that even ferries became stranded in the Solent because they were unable to unload any more vehicles on to the island. But John Giddings, promoter of the festival which is now in its 12th year, has pledged there will be no repeat of last year's mayhem as he will be providing increased car parking space with asphalt entrances to the car parks and segregated traffic routes to prevent festival traffic from interfering with local traffic. He said: "What happened last year was we had a month's worth of rain in 24 hours and the car parks just became inaccessible - that will never happen again. To avoid a repeat, there will be twice as much car parking space and there will be proper roads at the entrances and exits." As well as the improvements to the practicalities, Mr Giddings has transformed many of the attractions away from the main stages with new ones including a bohemian wood, cabaret club, extended dance tent, hot tubs and a bigger beach. And festival-goers will also be able to experience art in action with a piece of stone the size of a Stonehenge slab being transformed into a piece of sculpture during the weekend. Other acts performing at the festival, which runs from June 13 to 16 at Seaclose Park, Newport, include Paul Weller, Emeli Sande, Jake Bugg, Everything Everything, Blondie, Imagine Dragons, Ellie Goulding, Rizzle Kicks and Republica with the event starting on the Thursday night with The Farm and Happy Mondays.